Whew! It is not easy to finish a quilt in summer, but I did it. This is my first time participating in the Modern Quilt Guild Challenge. I decided to call this the Flourish Quilt. The fabric, Riley Blake The Cottage Garden, fits this quilt name too. 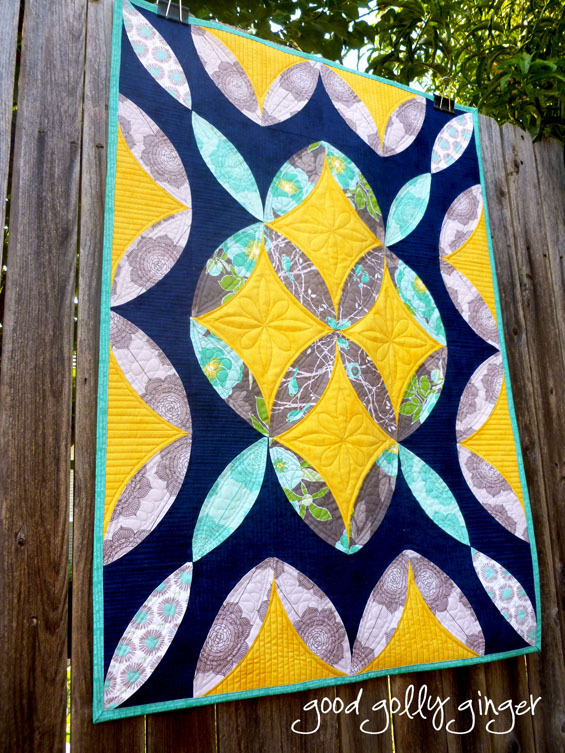 When I received the fabric from MQG, I knew I wanted to design a quilt that looked like it was in bloom. I also used Riley Blake Basic Shades in Sundrop and Nighttime. This was my first time using the Quick Curve Ruler by Sew Kind of Wonderful. This ruler made very quick work of piecing all those orange peel blocks. This quilt was also the first time that I did ruler work in my quilting. I used the Sidekick Ruler which matches perfectly to the Quick Curve Ruler. I also used six different thread colors! I've never done that before, and that sure adds a lot of extra work. I love how the back turned out. I chose a gray minky dot for the backing. I knew the texture from the quilting would be amazing. I finally remembered to add a tag before binding! I've had these tags for over a year! 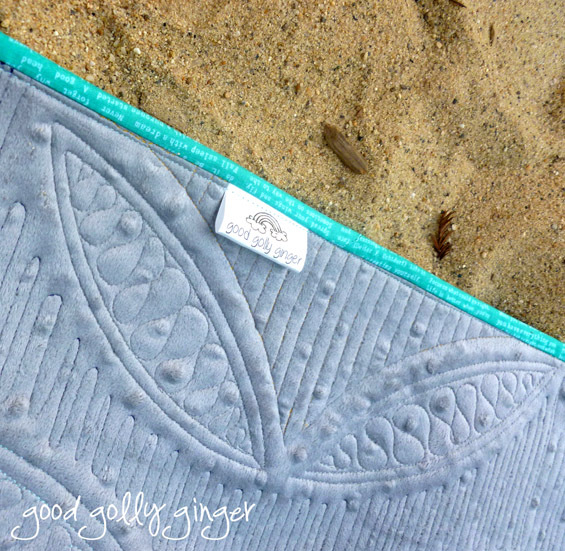 Summer break is almost over for the gingers, and I will soon get back into my quilting and blogging routine. In the meantime, I'm enjoying sleeping in, reading, and all the craziness with my ginger girls. 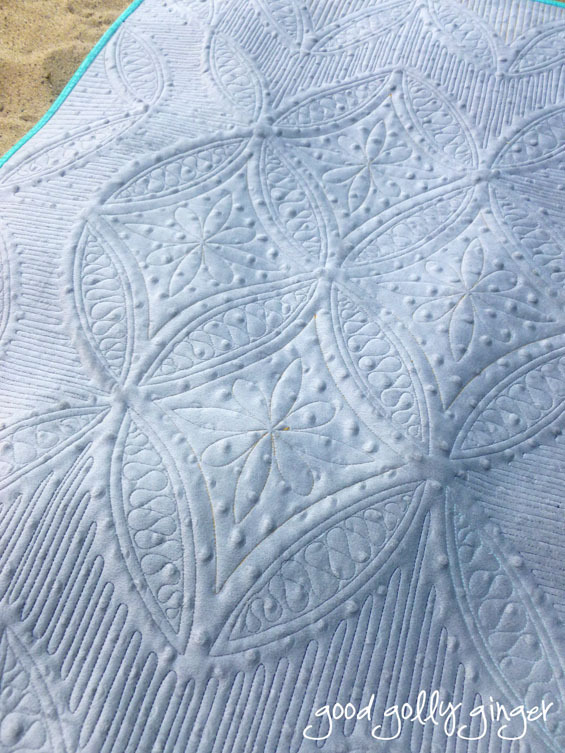 I love the quilting, it looks fantastic (and shows up very well on the minky back!). I like the colors you chose to go with the cottage garden fabrics, not what I would have expected, but they work well together! Beautiful quilt. 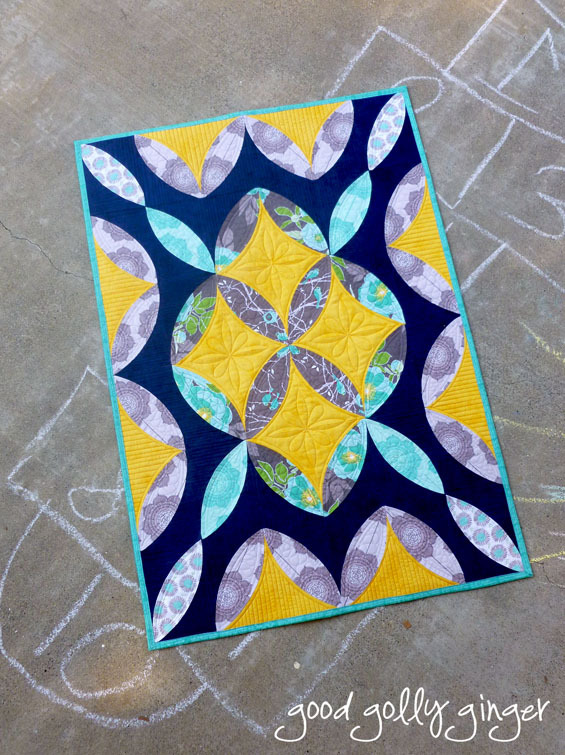 The colors work beautifully together and your quilting is gorgeous! Oh, yes! You've definitely succeeded in designing a quilt that is in bloom. It's wonderful! You need to write up a pattern for it. It would be a big hit! 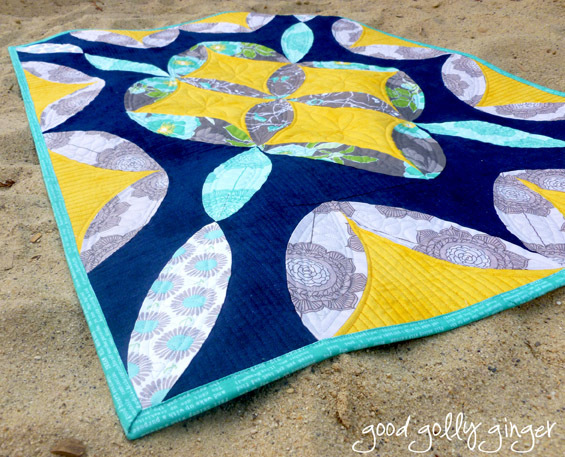 I love the quilt design, and the colors really pop, but the standout is that stunning quilting you've done! You did such a great job. Beautiful! I love the two different background colors, and the quilting. 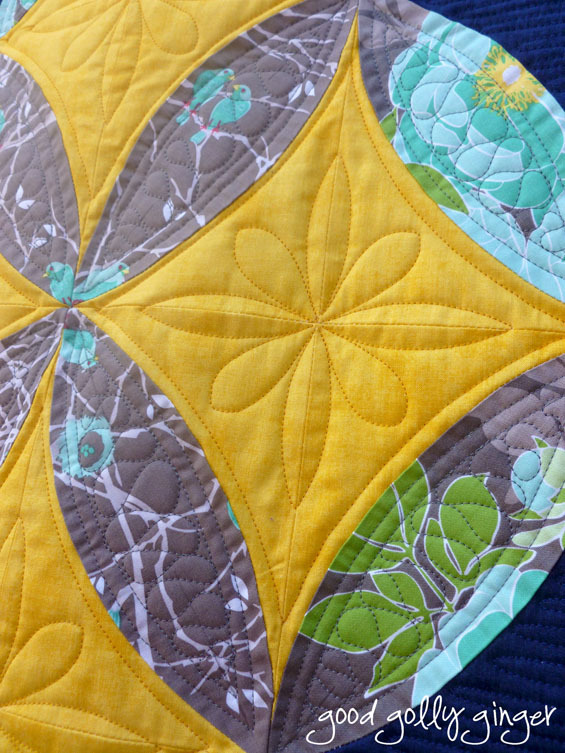 Love how your quilting really enhances the design without overriding it. Stunning quilt! Absolutely beautiful!! Your piecing is incredible! The quilting looks gorgeous on the front and the back. That really turned out great. Now I see what you meant about the quilting on the flip side. Your creativity and skill never cease to amaze me. Wow! What a stunning quilt. The colors just jump off the page.. it must be just gorgeous in person. Wow, that is seriously amazing. I thought the front was impressive until I saw the back. The way the quilting accents the minky dots is so awesome. I love it! Really impressive, everything works in this quilt, just beautiful! Lots of first times in this......very awesome and you did a great job! I love this quilt! It does look like it's in bloom. Great finish and I've wanted to try that quick curve ruler too... maybe soon after seeing your post! Thanks for sharing. Wow it's stunning! It looks like stained glass to me, utterly beautiful! Beautiful job! I love your solids choices! So different, and add so much to this set of fabrics. It really made this project totally yours. Congratulations on the finish. Wow!! That came out beautifully! I just want to run my hands down the back, haahhaa. The colors look wonderful together and I love the quilting. That is really a different quilt, I love how you quilted it. And that back showed it all off perfectly! And what a FANTASTIC finish it is Katie! Congrats! Found you on N&TT! Keep quilting on!